Longleat House is celebrating 70 years since it became the first stately home to open its doors to the public on a fully commercial basis. 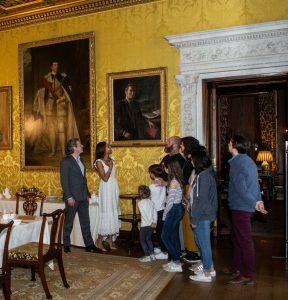 As part of the celebrations Viscount and Viscountess Weymouth, Ceawlin and Emma Thynn, have recreated iconic photos from the time featuring Ceawlin’s grandfather, the 6th Marquess of Bath, and his family welcoming visitors into their home. “My grandfather was a hugely influential figure in my childhood and his ground-breaking decision back in 1949 has been emulated throughout the country and created an entirely new type of heritage tourism,” said Ceawlin. “I am extremely proud of what he achieved and it is wonderful to have the opportunity to celebrate his massive role in opening it up to a wider audience and ensuring Longleat’s longevity as a privately owned home. “Hopefully we are honouring his memory by continuing to innovate and develop the visitor experience and remaining at the forefront of the attraction industry,” he added. A natural showman and highly charismatic figure, Henry Frederick Thynne, 6th Marquess of Bath, was part of the fashionable set dubbed ‘the Bright Young People’ by the press in the 1920s. While Viscount Weymouth, he went on to sit as MP for Frome from 1931 to 1935 and served with distinction as a Major in the Royal Wiltshire Yeomanry during the Second World War. Death duties payable after the death of his father, the 5th Marquess, in 1946 resulted in Henry selling much of Longleat Estate. He inherited the stately home of Longleat House still occupied by the Royal School for Daughters of Officers of the Army, a park with a hospital for American service personnel, and woods still providing cover for an RAF depot. With the House and remaining Estate far from secure, in 1949 he made the radical decision to open the doors of his family home as a tourist attraction. During its first season, which ran from April to September, the House welcomed a total of 137,985 paying visitors, a figure which wouldn’t be exceeded until 1962. The admission charge was two shillings and sixpence (equivalent to 12 1/2p), or one shilling (5p) for a child. Scores of other stately homes followed Longleat’s example and the heritage tourism industry was born. In 1966 Henry was also responsible for opening Longleat Safari Park; the first drive-through animal experience anywhere outside of Africa. Longleat House is widely regarded as one of the best examples of high Elizabethan architecture in Britain and one of the most beautiful stately homes open to the public. Substantially completed by 1580, this incredible house has been called home by 15 generations of the Thynne family. Today it is home to three generations: the 7th Marquess and Marchioness, Ceawlin, Emma and their two sons. During 2019 visitors can view objects from the Longleat Collections relating to the opening in 1949 as part of a special display within Longleat House. This entry was posted in Promoting Events, Promoting Venues, Venue Focus. Bookmark the permalink. Follow any comments here with the RSS feed for this post.